How to solve the energy choice dilemma and get back to business? What is the range of energy options? How to find the right answer? Solar Thermal Energy is now the Cheapest Source for Meeting Heating & Cooling Energy Requirements. How To Use Water to Slash Your Heating and Cooling Energy Costs? Why have a business energy assessment performed? With electricity and gas prices hurting the bottom line, and no pricing certainty yet in sight, large businesses are moving away from being solely dependent on main stream energy providers for their heating and cooling requirements. As they do this, they quickly come to realise that there are many economically viable alternative energy solutions that can dramatically slash their energy bills. What is the best renewable energy solution for your business? Well, it all depends. Factors include your type of business (e.g. do you need a supply of CO2 or not), hourly energy demand profile over a full year, business access to alternative energy sources, options for district energy solutions (e.g. multiple neighbourhood businesses banding together), appetite for investment, available funding subsidies at the time of the investment decision, outlook on conventional energy prices, land/rooftop space availability etc. Each type of energy source has its own unique pros and cons. The best solution, is therefore the one that optimizes the balance between their respective advantages and weaknesses to best meet your particular business needs. Geoflow can guide you through the decision making process to reach the optimum answer. We first sit down with you to learn about your business and its needs, and can conduct a free, no-obligation, high level feasibility study of energy options for your specific business. Once satisfied with the direction and likely business outcomes, we can then conduct detailed research into your energy usage profile (by energy type) and undertake a thorough feasibility to recommend the best cost saving options for you to consider. Geoflow does not focus on single energy source solutions like many others do. Our experience has shown that hybrid energy solutions often maximize energy cost savings and deliver the shortest return on investment time frame, as different energy resources are more cost effective under certain operating conditions. Large scale energy users can achieve cost savings of between 50% – 80%, with our assistance. Renewable energy systems such as solar thermal, can provide virtually free heating and cooling. However, they are most cost efficient (including the upfront capital cost) when they provide just the base energy demand (i.e. excluding the occasional peaks in demand). For example, heat stored by a solar thermal system during the day can be used during the night, and when the peak heating demand occurs at say 4am (when electricity is on an off-peak rate as low as 2cents/kWh), then heating can be provided more cost efficiently by switching over to either a geothermal or air source heat pump. 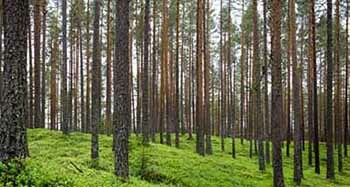 Alternatively, if a farm/business has good access to a free, reliable supply of waste wood, then no other energy technology can economically compete with that. Furthermore, greenhouse growers require CO2 during daylight hours to improve their production rates. Obtaining CO2 by burning gas costs almost half as much compared with purchasing bottled liquid CO2. Geoflow always recommends keeping existing gas boilers for CO2 production and storing the by-product heat for night time use. Many people think that solar electricity is the answer to their high heating and cooling cost, when in fact, it may be one of the least economic solutions for businesses with high thermal demand (i.e. heating & cooling). With the latest advances in technology, a far more cost efficient and effective solution is to generate energy from a solar thermal (hot water) heating and cooling system, which costs even less to run and maintain than a solar electricity system. Depicted below is an example of what a large scale solar thermal energy system looks like. It appears similar to a solar electricity system, but is 450% more efficient at generating useful heat! this heat can also be readily transformed into a cooling system by simply adding an absorption chiller , which costs virtually nothing to run and maintain, unlike conventional chillers. Geoflow is Australia’s preeminent renewable energy solution provider for solar thermal, geothermal, heat pump and biomass systems. We provide turnkey renewable energy solutions that are professionally engineered to the clients’ needs. Geoflow performs hourly energy modelling and quantifies the energy cost savings for a range of applicable energy efficient systems, to assist clients to make the best decision for their energy-saving investment. Geoflows’ services range from 3D energy modelling for compliance, energy audits and renewable energy feasibility studies, to the installation of one or a combination of solar thermal, geo thermal and other renewable energy systems. This page provides in-depth knowledge obtained by Geoflow over the last decade about cost effective, reliable and efficient energy resources mostly for heating and cooling applications. Please read, and contact us if you have any questions. Solar thermal heating captures the direct energy from sunlight, without the need to convert the energy into electricity first. Solar thermal water heating is the most developed solar technology and is very cost-effective when you consider the life-cycle costs. For this reason, the adoption of solar water heating worldwide is growing at an average rate of over 25 % per year. The simplest form of a solar water heating system is achieved by pumping water through black pipes exposed to solar radiation. Heat is absorbed by the pipes and then heats the water flowing through the pipes. Free radiation from the Sun can now be converted into useful energy at up to 80% efficiency by the latest generation of solar thermal collectors. This energy is being used for all sorts of applications (e.g. process heating, building heating, domestic hot water and swimming pools) that require heating (up to 95oC) and cooling (using chilled water down to 7oC). In comparison, solar electricity panels only convert solar radiation into electricity at around 15% efficiency. When the capital cost of a solar thermal system (which has a 25 year performance warranty) is amortized over say, just 20 years, at a 5% interest rate, an energy cost comparison between natural gas and solar thermal can be made. 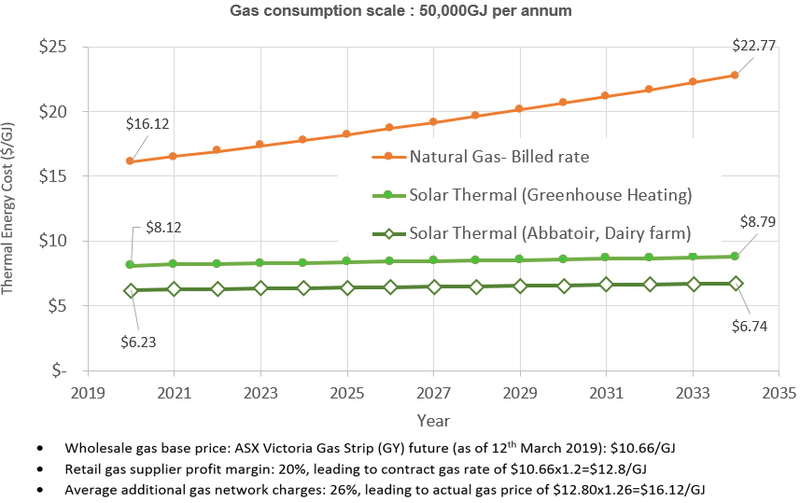 For a business that consumes 50,000 GJ of energy per annum, the current and forecast cost comparison between natural gas and solar thermal is shown below. From the above graph, the unit cost of energy using natural gas in 2020 is $16.10 per GJ. In comparison, the unit cost of using solar thermal energy for a business, such as an abattoir or dairy farm, is just $6.20 per GJ, or for a greenhouse $8.10 per GJ. The cost of solar thermal energy is less than half that of natural gas! The reason for their being two different solar thermal energy prices is that solar thermal energy generation costs depend upon on the thermal usage pattern. If solar thermal energy is used instantaneously at 60oC, such as for a domestic hot water supply as required in abattoirs, the energy generation rate is maximised. If the hot water is used in applications such as greenhouses, where solar energy is mostly generated and stored during the day, but used at night, then there are some system efficiency changes, and the average price slightly increases. Since each business is unique in their energy requirements, Geoflow uses sophisticated TRNSYS hourly modelling software to accurately inform clients of their calculated energy cost savings. Heat demand pattern: Based on an actual hourly demand of a tomato growing greenhouse in regional Victoria. Warranted maximum performance degradation of solar thermal collectors: 0.4% p.a. Finance term and interest rate for capital cost of supply & installation: 20 years @ 5% p.a. Solar thermal maintenance expense: 0.75% of capital cost p.a. The wholesale price of natural gas on the east coast of Australia, is derived from the base gas price at the Wallumbilla gas supply hub (implemented by the Australian Energy Market Operator – AEMO), to which gas supplier retail profit margins and network charges are added, to arrive at the actual billed cost of natural gas paid by the customer. 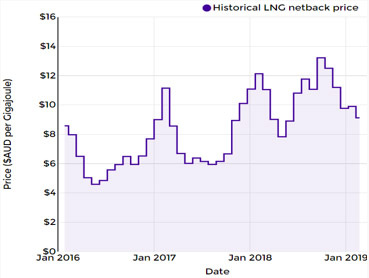 History of gas prices: The following graph shows the LNG netback price published and updated by ACCC every fortnight. 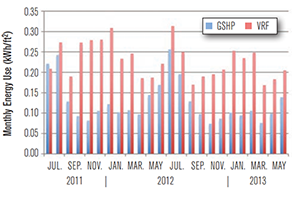 The annualised domestic natural gas price has been trending upward since Australia started exporting natural gas. Future of natural gas prices: In Australia, gas-fired electricity generation is projected to double over the next 30 years. 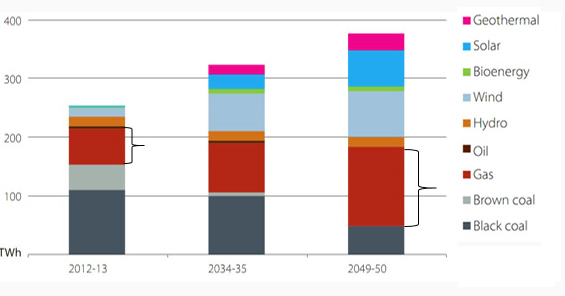 Natural gas is forecast to be the largest single source of electricity generation and to account for 36% of total electricity generation by 2049-50, as shown below. One of the rare consensuses amongst global energy analysts and intellectuals is that natural gas can lower CO2 emissions by replacing coal in power generation, and complement variable renewable energy sources. In the USA, Japan, China and elsewhere, the trend is projected to be similar, and demand for natural gas will increase as countries work to reduce CO2 emissions. This will no doubt put added upward pressure on natural gas prices, potentially to unforeseen heights. Large scale solar thermal heating systems (such as that depicted above) work similar in principle to domestic solar hot water systems, but on a much larger scale. They generate enough heat to cover most of the heating demand for businesses such as dairy farms, poultry farms, greenhouses, or any business that requires a considerable amount of heating below 100˚C. Heating and cooling your space / water from direct sunlight through solar thermal collectors is basically FREE energy, as the only running cost to keep the system operational is a small hot water pump (flow rate less than 0.005 l/s per m2 of solar collector). Solar thermal heating and cooling is now an advanced solar technology thanks to the use of innovative absorber technology, and is exceptionally cost-effective over its life-cycle. Solar thermal heating and cooling can be used to condition the air space of any building – from a single residence to a whole retirement village, and even large greenhouses or poultry sheds. Water heated by the solar thermal collectors is stored in a hot water storage tank and used by the end user when required (day and/or night). The hot water energy storage in this system is used like a battery to match energy generation and demand, and unlike electric battery storage, it doesn’t cost a fortune and doesn’t die before paying itself back. When there is insufficient solar irradiance, water heating is supplemented by an auxiliary booster/boiler to ensure 24/7 availability of hot water. When a solar thermal system is combined with an absorption chiller, the generated hot water from the sun can be used to create 7°C chilled water for cooling applications. The fascinating fact about this form of cooling is that the solar thermal cooling system capacity and efficiency is highest when the outdoor temperature is warmer! Savosolar of Finland, manufactures the world’s most efficient large-scale solar thermal collectors (See Figure), and has delivered major projects in seventeen countries across four continents. Geoflow Australia has partnered with Savosolar and brought the latest solar thermal technology and expertise into Australia and New Zealand. The Savosolar solar thermal collectors use an innovative and award winning absorber that generates up to 1110kWh p.a. of heating energy per m2 of solar collector – that’s more than five times (500%) the amount of energy compared with an equivalently sized solar electricity (PV). The Savosolar absorber is a uniquely designed nano-coated aluminium multi-port channel section (see Figure 2) that allows fluid in the solar panel to be in more direct contact with the sun’s energy across the entire solar heated surface! This design eliminates the high thermal gradients and heat losses of conventional absorbers, and maximizes the thermal efficiency of the solar thermal collector. Savosolar’s collectors are approximately 50% more efficient than conventional flat plate collectors (with copper pipe and fin) and evacuated solar tubes, and come with a 10 year manufacturer’s replacement warranty and 25 year performance warranty. Free Heating: Solar thermal provides free heating energy and is a largely maintenance free system. It has no moving parts except for a small pump (flow rate 0.005 L/s/m2 ) to keep water in circulation. Free Cooling: An solar thermal system, combined with an absorption chiller, will deliver free cooling. The overall solar thermal cooling system capacity and efficiency is highest when the outdoor temperature is warmest and there is more demand for cooling! Over five times the energy: In principle, Savosolar thermal collectors can deliver 1,110 kWh p.a per m2 of collector, compared with just 220kWh p.a. per m2 for and efficient solar electricity panel! In other words, Savosolar solar thermal panels generate over five times the energy of solar electricity panels, for businesses with heating as their biggest energy cost. Simple and Cheap Storage: Solar thermal systems generate energy in the form of hot water that is stored in large hot water tanks. Storage tanks cost approximately $600/m3, or less than $8/kWh. Electric storage batteries can cost $800/kWh. Hot water storage tanks can be used an unlimited number of times within their expected 25 year life span, whereas batteries only last around ten years under very specific operating conditions. Suitable for any land: Solar thermal collectors can be installed on roofs, hills and sloping sites. Energy Independence: Solar thermal systems can bring real energy independence. If for any reason in the future, Australia is in short supply of gas, this won’t affect business. Solar thermal systems can also provide a huge price advantage as gas prices increase further. Long Warranty Period & Life Expectancy: Savosolar solar thermal collectors carry a 10 year product warranty and a 25 year performance warranty. There are different types of solar thermal collectors that may be used to produce temperatures of about 100ºC, or less, which are applicable for uses such as building heating and cooling, domestic hot water and industrial process heat. Solar thermal energy is well-suited for any energy intensive commercial applications, including horticulture and greenhouses, swimming pools and diary processing factories. Large scale solar thermal (hot water collector) systems can provide the lowest cost option for energy access. Using the solar thermal renewable energy resources can help to improve energy access, diversify farm revenues, avoid disposal of waste products, reduce dependence on fossil fuels and GHG emissions, and help achieve sustainable development goals. As of 2017/18, there are a range of subsidies available to assist lowering the capital cost of solar thermal systems and to make it by far, the most feasible energy solution for high energy demand processes in the agriculture, industrial and entertainment industries. Solar thermal panels, which are mostly known as solar hot water panels, comprise a set of water flow passes by which solar heat is conducted to the water flow and stored as thermal energy. Different types of solar hot water collectors are discussed and compared in the following sections. Evacuated tubes perform best in cold climates with temperatures well below zero degrees, such as in Northern Europe. Evacuated tubes consist of sunlight-absorbing metal tubes inside two concentric transparent glass tubes. The air space between the two glass tubes is evacuated to prevent losses due to convection. 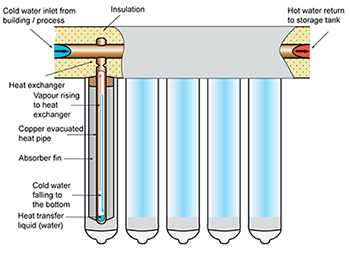 Evacuated tubes have lower heat losses when generating high temperature hot water. However, they cost almost twice that of flat plate collectors and according to statistics from Sustainability Victoria, they are not a cost effective solution for the Australian climate, where outdoor ambient temperatures seldom get below zero degrees. Please see the comparison of collectors for further technical discussion. Flat plate collectors are a more widespread system in the market. They use an array of 8-10 parallel copper pipes (risers) welded at both ends to larger diameter copper collector pipes, called headers. An absorber copper plate (called a “fin”), is welded to the riser pipes. The solar energy incident on the absorber plate is transferred to the fluid flowing through the riser tubes. Cool water enters at the bottom header, and warmed water exits from the top header. The absorber is usually contained in an insulated box with transparent glass on the face. Flat plate collectors with an aluminium multi-port extrusion (MPE) section are mainly used in large-area collectors for commercial, district heating and industrial applications. These collectors achieve the highest efficiency in flat plate collector technology by using a direct flow approach for heat. The inefficient fins are eliminated and water is more directly in touch with the absorber over the full face of the collector. In MPE flat plate collectors, the average distance for the energy to travel from the absorber surface to the circulation fluid is much shorter, and heat distribution is much more even over the absorber. This leads to a fin efficiency of over 99%, and practically no heat losses in the absorber. The higher efficiency of MPE solar hot water collectors means that these collectors will either supply more energy from an equivalent area of installed collectors, or allow the required amount of energy to be harvested by using fewer collectors, and requiring less land or roof space. 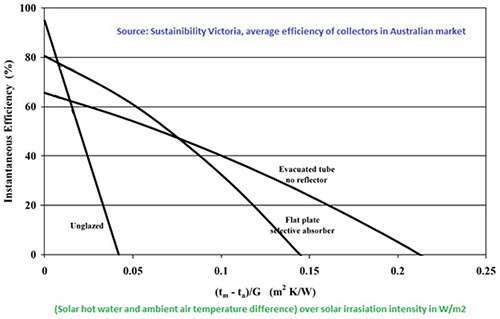 The Figure below shows the comparison between evacuated tube and flat plate solar collectors that have been averaged from the collectors available in the Victorian solar market by Sustainability Victoria (SV). Unglazed collectors have also been shown for comparison, which are not detailed here, due to their low efficiency – as can be seen from the comparison below. The horizontal axis in the Figure below shows the difference between solar hot water temperature inside the collector and ambient air temperature over irradiation intensity in W/m2. As the temperature difference rises (due to colder ambient air temperature, or very hot water generation by the collector), the heat loss from the collector increases, which means a reduction in efficiency of the collector. For countries like Sweden, with winter ambient temperatures of minus 20C, there are a few benefits for evacuated tube collectors over flat plat collectors, as they lose less heat in colder ambient temperatures. However, the Australian climate is different and we seldom get any temperatures below zero degrees, which means that less-expensive flat plate collectors perform better than the expensive evacuated tubes. For example, let’s compare the efficiency of flat plate collectors and evacuated tubes for the worst case scenario in Australia, which takes place in the Melbourne climate (i.e. Zone 4 of Clean Energy Regulator). Melbourne is the main city in zone 4 of subsidy divisions, and receives the least subsidies for renewable energy due to its lower solar irradiation intensity and its lower ambient air temperature. 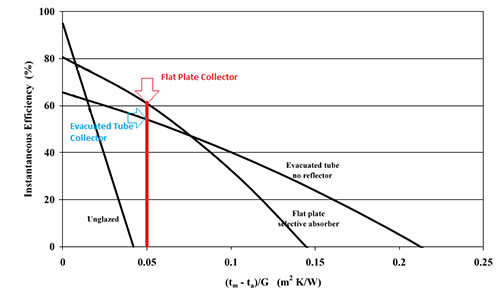 The Figure below shows the value of 0.05 on the horizontal axis extending vertically to calculate typical efficiency for an average flat plate collector and evacuated tube. Evacuated tube achieves efficiency of 55% while the cheaper flat plate collector achieves efficiency of 62%. 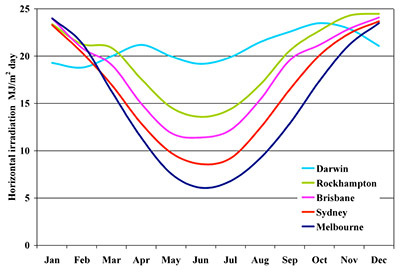 For climates like those found in Sydney and Brisbane (zone3), Alice Springs (zone 2) and Rockhampton (Zone 1), there is more solar irradiation available, and the ambient temperature is closer to the average solar hot water temperature, which makes the value for the horizontal axis even smaller than 0.05 in the above picture, which means that flat plat collectors are even more efficient in warmer climates of Australia compared with Melbourne. 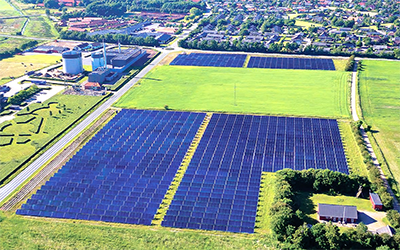 Savosolar collectors are flat plate collectors with aluminium MPE absorbers, and are the most efficient flat plate collectors in Europe. Considering the comparison made between flat plate collectors and evacuated tubes, Savosolar collectors are the most efficient solar collector for the Australian climate. 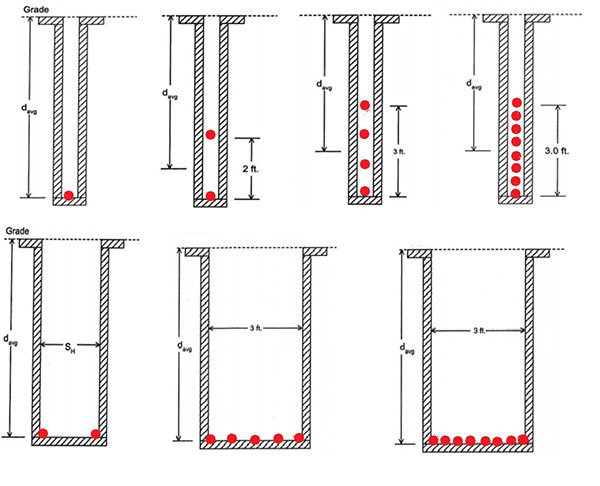 The different collector areas for flat plate and evacuated tube collectors are shown in the Figure below. The gross collector area includes the outside dimensions of the product and defines the minimum amount of roof area of the collector. The aperture area is the area that corresponds to the light entry area of the collector. 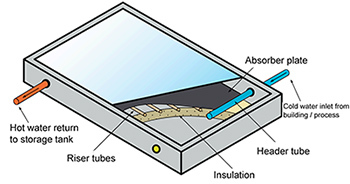 The absorber area is the area that receives solar energy. The absorber area of the heat pipe collector is the plan area of the array of tubes and does not include the gap between tubes. The area of tube arrays with a parabolic reflector behind the tubes is the area of parabolic reflector. The basis for defining solar collector efficiency is on the basis of gross, aperture or absorber area. If alternative solar collectors are compared on the basis of efficiency, care must be taken to use the efficiency with the collector area that was used by the test laboratory to compute the efficiency. 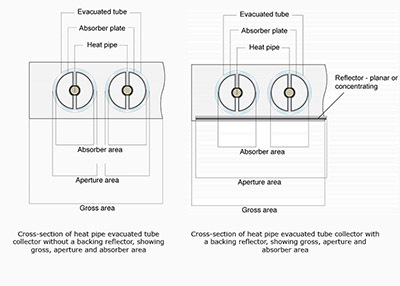 Evacuated tube solar collectors that do not incorporate a reflector behind the tubes typically have efficiency reported on the basis of the aperture area. Such a report would imply a very high efficiency, however, it must be noted that the efficiency curve is based on a smaller area than an evacuated tube collector incorporating a reflector or a flat plate collector. The choice of the appropriate pairs of values of efficiency and reference area has no effect on the computation of the energy delivery, as the product of efficiency times area is the same, whether gross, aperture or absorber area is used. To compare the heat output of different solar collectors, the product of efficiency times aperture area should be compared rather than efficiency alone due to the bias that can be introduced into efficiency specification by using the smallest area to define efficiency. 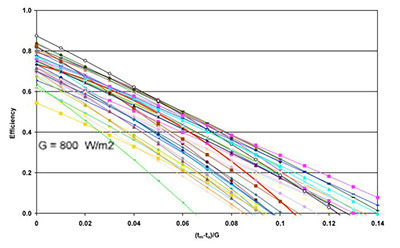 The range of solar collector efficiency parameters for different product types can be compared on the basis of a linearized efficiency (equation below) versus (tm – ta)/G fit to the test data, as shown in the Figure below. For the evaluation of the solar collector heat output, a three coefficient non-linear efficiency characteristic (equation below) is required to accurately represent the high (tm-ta)/G performance of glazed flat plate and evacuated tube collectors (refer to AS/NZS 2535). 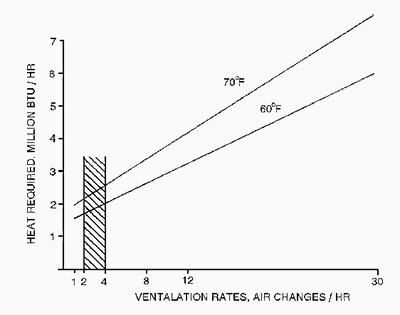 The bottom of the graph in above Figure represents the difference between the average fluid temperature in the collector (tm) and the ambient air (ta) divided by the incident solar radiation (G). Solar radiation under clear sky conditions is of the order of 1000 W/m2. As the value of (tm – ta)/G increases, the temperature difference between hot water inside the collector and ambient air increases. Some of the absorbed heat by collector is lost to ambient which reduces the overall efficiency of solar thermal collector. In addition to the normal incidence efficiency, the off-normal incidence performance of a collector must also be considered. 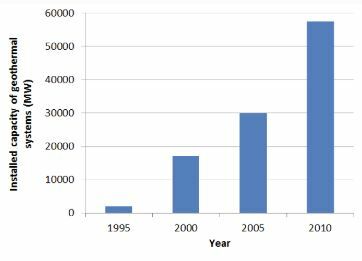 Off-normal incidence performance of Savosolar flat plate collectors is shown in the Figure below. 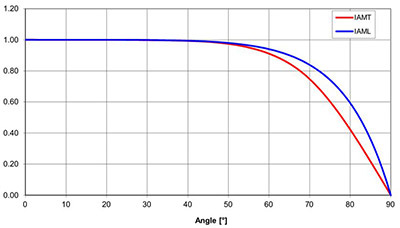 Flat plate collector performance decreases when the incident angle of the sun is not normal (i.e perpendicular) to the collector aperture due to reflection losses in the cover. This reduction is only 2% for Savosolar, which is exceptionally low. The off-normal efficiency of a collector is given by equation below, where Κτα is the incidence angle modifier. The η0 coefficient defines how a collector will perform when the ambient air temperature is the same as the mean collector temperature. Using this coefficient alone to calculate the efficiency can lead to inaccurate results. The α1 and α2 coefficients define how the collector will perform when the ambient air temperature is lower than the mean collector temperature. If a collector performs well in cold climates, or with high fluid temperatures, it will have very low α1 and α2 coefficient values. Κτα defines how the collector will perform when the sun is not directly above the collector. Note: Care should be taken not to oversize the solar collectors. Systems with too much solar contribution can lead to prolonged stagnation conditions and very high temperatures. For Large Scale Solar Thermal systems with a non-constant load pattern, detailed hourly analysis should be done to ensure that there are not long periods of time when there is no load placed on the collectors. The efficiency of different solar collector products depends on the product configuration and the methods used to limit heat loss. The range of efficiencies observed in commercially available flat plate collectors in Australia is shown in the Figure below. The low-efficiency products use black absorbers and low-transmission glass, and as a result are less expensive compared with high-efficiency products that incorporate selective surface absorbers and high-transmission glass covers. The most appropriate solar collector is the one that can deliver the minimum energy cost over the life of the system at the required temperatures. In some cases, a low-efficiency product may be the most cost-effective solution. Content is extracted from the handbook published by Sustainability Victoria with slight modifications: Large Scale Solar Thermal Design Handbook, December 2009. This significant difference in energy output is mainly due to the fact that Savosolar utilizes multi-port extrusion (MPE) profiles as its absorber, which allows the sun’s energy to more directly enter the heat transfer fluid below the absorber surface (refer Figure below), thus delivering an absorber of over 99% efficiency. Savosolar collectors also utilize a patented nano-coating that allows the absorption of almost all solar energy irradiated onto the collector. The anti-reflection and low-iron glass built into the collector also provides a very high transmittance of solar energy. The efficiency of different solar collector products depends on the product configuration and the methods used to limit heat loss. The low-efficiency products use black absorbers and low-transmission glass, and as a result, tend to be less expensive compared with high-efficiency products that incorporate selective surface absorbers and high-transmission glass. The average efficiency of all flat plate collectors sold in Australia (shown as the red line in Figure below) can be calculated by the equation as shown. A typical high efficiency solar flat plate hot water collector that incorporate selective surface absorbers and high – transmission glass covers (i.e. efficiency above the red line) has the following efficiency parameters. Average European collector has a very similar efficiency. Depicted below is an efficiency comparison between Savosolar thermal collectors, the industry average, and above-average solar flat plate collectors. 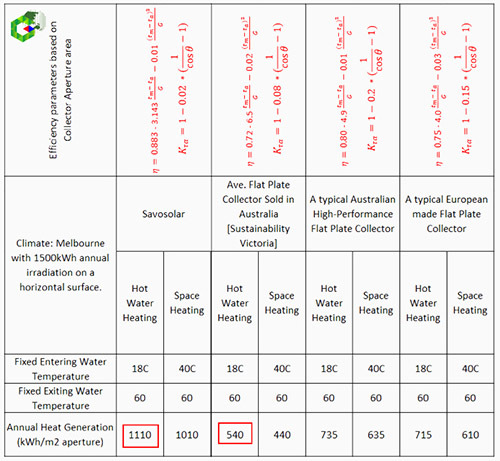 Efficiency of average and above-average solar flat plate hot water collector compared with a Savosolar collector (Redline source: Sustainability Victoria). Note that all efficiency parameters are based on aperture area. Savosolar collector’s efficiency is based on absorber area which is only 1% different to its aperture area. Solar domestic hot water generation (or open loop system) with fixed 18oC water entering the solar collector. Solar space heating (or closed loop systems) with fixed 40oC return water entering the solar collector. Geoflow Australia has applied the abovementioned efficiency parameters for annual performance modelling into TRNSYS hourly modelling software utilising Melbourne climate data. In both applications, water is heated by a solar hot water collector to the fixed temperature of 60oC (i.e. annual average water temperature from a typical residential solar hot water system in Melbourne). Demand and storage, are assumed to be unlimited to keep this comparison simple. For hot water heating applications, Savosolar solar thermal collectors generate more than twice (i.e. 1110 kWh/540 kWh= 205%) the amount of heat generated by the average solar thermal collector sold in Australia. For space heating applications, Savosolar solar thermal collectors also generate more than twice (i.e. 1010 kWh/440 kWh= 229%) the amount of heat generated by the average solar thermal collector sold in Australia. Note that the above energy yields are correct for the Melbourne climate. Melbourne receives one of the lowest levels of solar irradiation in Australia, and any city north of Melbourne will deliver even more solar energy annually. Furthermore, the above energy yields are based on fixed entering and leaving water temperatures, to and from the solar thermal collectors. Under different circumstances, one might use the system at a temperature lower than the values adopted above and get even more energy per annum. Similarly, one might not frequently use all the heat derived from a solar thermal system, and hence the operating temperature will be more than those adopted in the table, and less heat would be generated per annum. Now compare with a high efficiency Solar PV panels of 128 W/m2 AC power. The amount of solar radiant energy incident on a surface per unit area and per unit time is called irradiance or insolation. The energy delivered by the Sun is both intermittent and changes during the day and with the seasons. The solar irradiation flux changes from place to place, and some parts of globe receive much higher solar irradiance. Australia has one of the highest average solar radiation levels per square meter in the world (Geoscience Australia and ABARE, 2010). 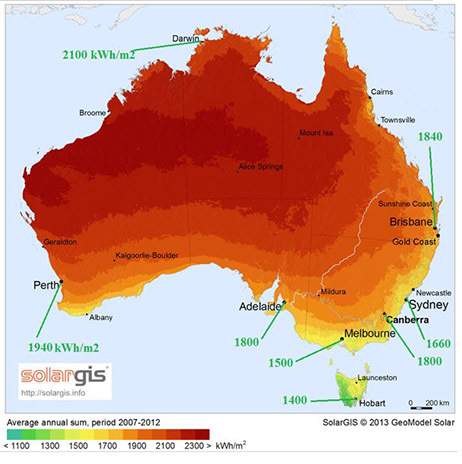 In Australia, a 24 hour average of 200W/m2 solar irradiation is received at ground surface level. When 200W/m2 is integrated over 1 year, the resulting 1,500kWh/m2 that is incident on 1m2 at ground level is approximately the energy that can be extracted from 1.2 barrels of oil, 230kg of coal, 160m3 of natural gas. Figure below shows the annual sum of total solar irradiation on horizontal surface in some of Australian Cities. The Figure below shows the distribution of total solar irradiation on a horizontal surface in some of Australian Cities during a year. 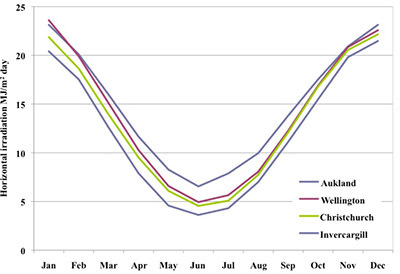 Figure below shows total solar irradiation on horizontal surface in some of New Zealand’ Cities during a year. 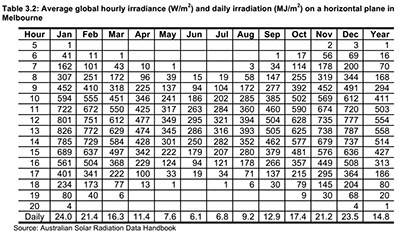 For Melbourne, the hourly average per month data from “solar radiation data handbook” is presented in Figure below. The average irradiation in day time (just the figures presented below) shows that Melbourne gets an average of 313W/m2 day time solar radiation from 5AM to 8PM, and an average of 400W/m2 between 8AM and 5PM during the year. While it is best to maximize the separation of rows of solar thermal collectors, Geoflow would like to minimize valuable land foot print of solar thermal system. Figure below shows the effect of solar collectors’ rows separation on amount of energy delivered by the solar thermal system with panel that are 2m tall at full standing position. In case it is decided to install ground mount collectors, here the effect of separation on energy delivery and shading loss is assessed. Figure 17 shows variation of shaded solar irradiation and shading loss with change in separation of the solar collector rows. This is case study for 50 rows of collectors with 30 collectors per row and solar collector is 2.0m tall. More detail is presented in Table 1. With 3m separation loss is 11% and increasing separation to 4m, loss drops by 5%. Further increases drops the loss by less than 2%. Hence 4m spacing is ideal for this case. For 2.5m2 collector (2×1.25m), 4×1.25=5m2 land is required or for 1m2 collector, 2m2 land is required. For copper piping, the pipe sizes and flow rate used should ensure that the maximum velocity is 3 m/sec. Refer to ‘AS/NZS 3500’ for flow rates and performance charts for pipe sizing. Flow in the collector loop in the range 0.2 to 0.4 L/(min ·m2 aperture area) or 0.0033 to 0.0066L/sm2 The lower margin is achieved to minimise heat loss in distribution pipes. We take the 14L/s as the design parameter for pipe sizing and design the pump for 20 L/s with VSD. Most Victorian and Tasmanian homes, and houses with swimming pool in other states, are heating dominant. Almost 60% of a typical household Victorian energy bill is for heating purposes, and a small swimming pool operated only a few months a year can demand 2-5 times the house heating load. 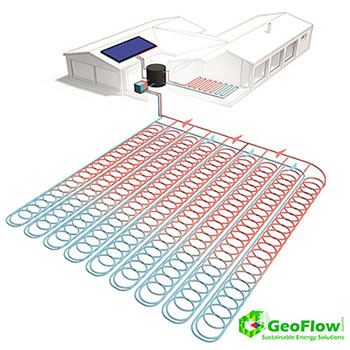 For heating dominant houses, Geoflow has implemented a new type of system to further increase efficiency and upfront/ongoing cost savings for geothermal systems, thanks to the federal subsidy on solar thermal panels. While geothermal systems are the most efficient form of air conditioning , they require extra ground works to install ground loops which make them quite an expensive option. 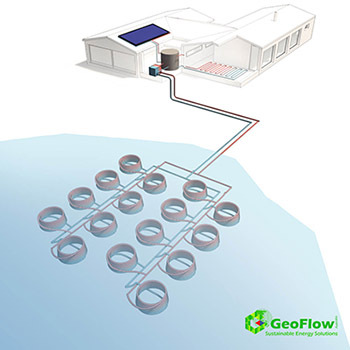 In order to make geothermal heating and cooling systems more affordable and more efficient, Geoflow has come up with a solution to minimize groundwork and total ground loop length. This is achieved by combining solar thermal collectors (i.e. 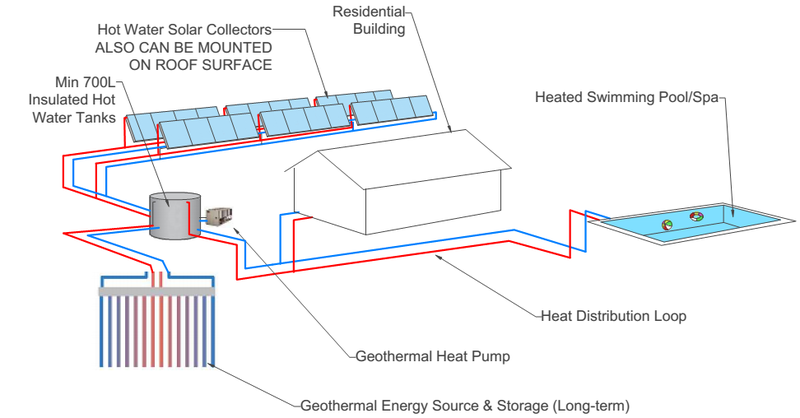 solar hot water collectors) and geothermal ground loops. 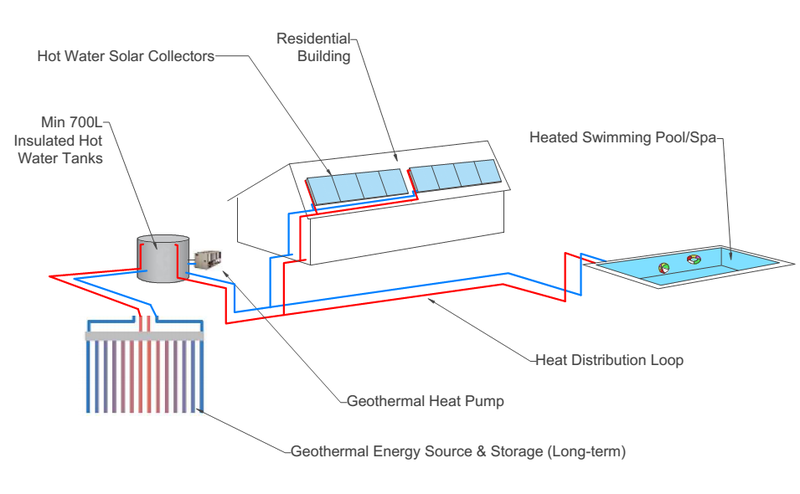 In a hybrid of geothermal and solar thermal system, solar heat is absorbed via hot water collectors and stored in a hot water tank (>700L) for daytime use. The excess generated solar heat can then be transferred to the geothermal system, to be stored in the ground for winter usage. Heat moves by temperature gradient and if the water temperature inside the geothermal pipes is more than ambient ground temperature, heat will flow through geothermal pipes to the ground and stored in the ground thermal mass. The stored heat is extracted for night time use and directly fed to the building to satisfy heating demands when it is hotter than 40°C. During the winter season, the ground surrounding the geothermal pipes is warmer than natural ground, which allows boosting the efficiency of the geothermal system to maximum possible levels allowed by current heat pump technology. 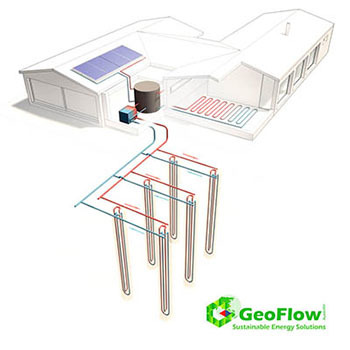 Geoflow designs hybrid geothermal and solar thermal systems with TRNSYS software to accurately model the interaction of both systems for each hour of the year. Depending on the geology and ground thermal properties of your building site, the ground can store 2,000-3,000 kJ/m3.°C. In Melbourne, the top 50m ground temperature is 18.5°C and ground temperature can be safely increased up to 50C. For Melbourne’s moderately weathered mudstone bedrock, the maximum amount of energy that can be stored in a single 50m borehole is calculated to be 8,500 kWh. 2700kJ/m3C*(50-18.5)C*(3.14/4*3^2*50)m3/3600(kJ to kWh conversion) = 8,500kWh. Clicking on this line will allow the formulae to appear. Note that a typical 200m2 new-build 6-star house in Melbourne requires 6,300kWh for annual heating and cooling requirements. Solar thermal and geothermal works like solar PV and battery system except that battery dies in 10 years and geothermal has an indefinite life expectancy. Also, solar PV can take up to 180 Watts of power and solar thermal can absorb 600 Watts of heat. Solar thermal and geothermal also costs a fraction of solar PV and battery. Below is a comparison of solar PV and battery and Solar thermal and geothermal. Large scale solar thermal heating systems are similar in operating principle to domestic solar hot water systems, but operate on a much larger scale. They generate hot water to supply most of the space heating / hot water demand of a building or business – from Olympic sized swimming pools, to retirement villages, dairy and poultry farms, and greenhouses, or any business that requires a considerable amount of low temperature heating or hot water (i.e. <100oC). Savosolar of Finland manufactures the world’s most efficient large-scale solar thermal collectors (Figure below), and has delivered major projects in seventeen countries across four continents. Geoflow has partnered with Savosolar and brought this latest solar thermal technology and expertise into Australia and New Zealand. The Savosolar solar thermal collectors use an innovative and award winning absorber that generates up to 1110kWh p.a. of heating energy per m2 of solar collector – that’s more than five time (500%) the amount of energy compared with an equivalently sized solar electricity (PV). The Savosolar absorber is a uniquely designed, nano-coated, aluminium multi-port channel section (Figure below) that allows fluid in the solar panel to be in direct contact with the sun’s energy across the entire solar heated surface! This design eliminates the high thermal gradients and heat losses of conventional absorbers, and maximizes the thermal efficiency of the solar thermal collector. Savosolars’ collectors are therefore approximately 50% more efficient than conventional flat plate solar collectors (with copper pipe and fin) and evacuated solar tubes collectors, and come with a 10 year manufacturer’s performance warranty. 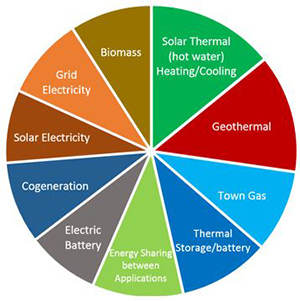 The main components of a large scale solar thermal system are presented in Figure below. Water heated by the solar thermal collectors is stored in a large hot water storage tank and used by the business when required (day and night). When there is insufficient solar irradiance, water heating is supplemented by an auxiliary booster/boiler to ensure 24/7 availability of hot water. When a solar thermal system is combined with an absorption chiller, the generated hot water from the sun can be used to create chilled water for cooling applications. The fascinating fact about this form of cooling is that the solar thermal cooling system capacity and efficiency is highest when the outdoor temperature is warmer! 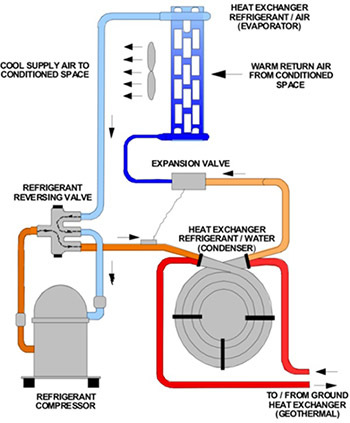 Depicted below is a typical Savosolar solar thermal district heating/cooling and hot water system in operation. Geoflow is currently working with major clients from Shepparton to Melbourne to Warragul. Projects include buildings/sites from 2,000m2 to 250,000m2 in area, as well as combined solar/geo thermal projects for bespoke buildings. Free Cooling: Solar thermal, combined with an absorption chiller, will deliver free cooling. The overall solar thermal cooling system capacity and efficiency is highest when the outdoor temperature is warmest and there is more demand for cooling! Five times the thermal energy: In principle, Savosolar thermal collectors can deliver 1,110 kWh per m2 p.a. of collector, compared with just 220kWh per m2 p.a. of solar electricity panel! In other words, Savosolar colectors generate five times the thermal energy for businesses when heating is their biggest energy cost. Simple and Cheap Storage: Solar thermal systems generate energy in the form of hot water that is stored in large hot water tanks. Storage tanks cost approximately $600/m3, or less than $8/kWh. Electric storage batteries can cost $800/kWh. Hot water storage tanks can be used an unlimited number of times within their expected 25 years life span, whereas batteries only last around ten years under very specific operating conditions. Suitable for any land: Solar thermal collectors can be installed on hills and sloping sites. Long Warranty Period & Life Expectancy: Solar thermal collectors have 10 years product warranty and 25 years performance warranty. Low Installation Cost: Solar thermal systems (without any subsidy), depending on the system size, cost about $400/m2. Local and federal governments also provide low-interest loans in support of installation of renewable energy systems. Organisations such as the Clean Energy Finance Corporation and Sustainable Melbourne Fund are backed by government bodies in providing these services. The average cost of a large scale solar thermal collector system is $400-$600 per m2 of collector – excluding any subsidy that may be available. Depending upon the local gas or other competing energy prices, payback is typically between 4 to 6 years. With federal government subsidies for eligible businesses, the installation cost can be 30% less, with a correspondingly quicker payback. GeoFlow also offers free high-level feasibility studies for prospective clients, to calculate the hour by hour energy cost saving with large scale solar thermal systems, to demonstrate the cost saving potential to business owners. Want to know what the most cost efficient method is to satisfy your long term building thermal energy demand? Here is the solution. In heating mode of operation, solar thermal (hot water) collectors transform solar energy into heat that is stored in a hot water storage tank. The stored heat is used for heating the house, swimming pool and domestic hot water . 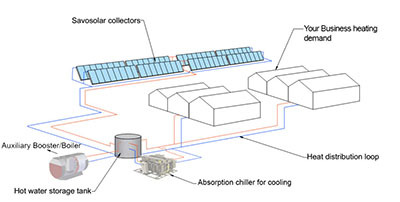 In cooling mode of operation, solar thermal (hot water) collectors transform solar energy into heat that is stored in a hot water storage tank and passed through an absorption chiller to generate 7C chilled water to cool the house. The hotter the air outside, the more free solar cooling you get to enjoy on the inside (it’s like magic!). 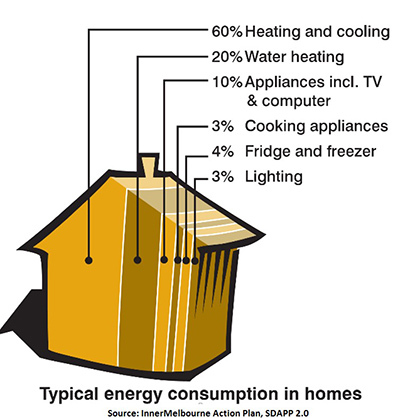 In a typical house in Victoria, Australia, almost 80%[i] of domestic energy usage is for meeting thermal requirements, such as space heating and cooling, and domestic hot water heating (see Reference). The remaining 20% of energy usage is for appliances and lighting, which can be satisfied with a properly sized 2-3kW solar electricity system. For homes with a heated swimming pool, the total amount of household energy usage dramatically increases, and the percentage of energy used to meet thermal demand rises close to 90%. Consequently, finding the optimum energy delivery method to meet household thermal demand is the key to significantly reducing energy costs and CO2 emissions. Renewable solar electricity and solar hot water generation is limited and sporadic. Solar energy (electricity or thermal) therefore needs to be stored to satisfy the household thermal demands – mostly at night time when the house is occupied. Solar thermal energy can easily be stored in one or more mega-litre insulated stainless steel hot water tanks that have a very long design life and a much higher storage capacity than solar batteries. For instance, a 3,000L hot water storage tank can store up to 200kWh, which is 20 times a typical household battery storage capacity. In addition, hot water storage tanks have unlimited charge/discharge cycles and cost a fraction of the cost of an equivalent solar electric battery. Combining solar electricity panels with battery storage and a heat pump, costs more and isn’t as efficient as a solar thermal solution, and will still suffer from the regular cost of battery and heat pump replacement approximately every 10 years. Geothermal systems efficiently heat and cool buildings using sustainable geothermal energy accessed via geothermal ground loops. In closed-loop systems, geothermal ground loops comprise pipes embedded in small diameter drilled boreholes or 1m wide trenches or even built into foundations, all within a few tens of metres from the surface. The geothermal systems are just starting to be generally known in Australia with relatively few, but highly varying and diverse installations to date offering a potentially economically viable and environmentally friendly method for heating and cooling of buildings. Geothermal systems require ground works like excavation or drilling to bury the geothermal ground loops. This is the major difference between a geothermal system and any conventional heating and cooling system. The ground works lead to higher capital costs for installation. 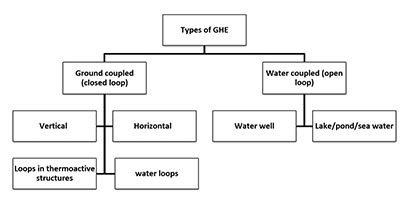 The design of geothermal ground loops in Australia is mostly achieved with simple rules of thumb. The geothermal ground pipes buried within a few tens of metres of surface as a heat source in winter and heat sink in summer. An open water loop system involves water being removed from the ground or body of water and returned after heat is extracted or added. 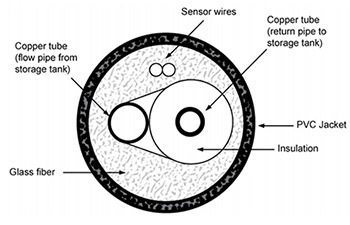 Clearly, considerable care must be directed at the location of the return system so that the discharge water does not affect the intake temperatures. One of the major advantages of these systems is that relatively large volumes of water can be handled leading to large quantities of heat exchange. An important issue with open-loop systems is water quality. Mineral deposits can build up inside the heat exchanger. Iron, calcium and other impurities can clog a return well, and organic matter from ponds and lakes can damage a geothermal system. Water should be regularly tested for acidity, mineral content and corrosiveness. Though this system is called an open loop system, it can be designed so that ground water does not come into contact with any contamination as it is under positive pressure all the time. Minerals precipitation risk can also be reduced by maintaining positive pressure and limiting water temperature change. Most commercial application requires ground water for their other purposes like irrigation or sanitary applications. In such case, there is free access to the ground water and all needed is to install a geothermal heat pump (water to water heat pump) to extract/reject energy to the ground water before it is used for its main purpose. This is a cheap energy efficiency measure which can pay back instantly as there is already access to ground water. 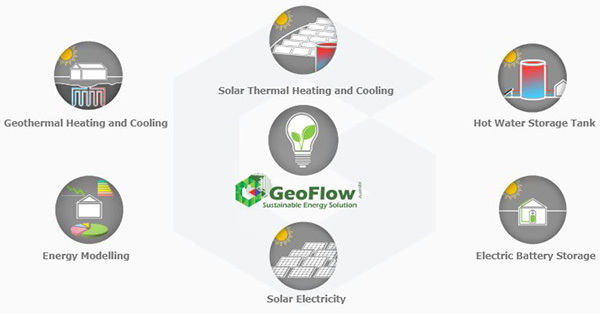 Geoflow is Australia’s preeminent renewable energy solution provider for properly engineered solar thermal, geothermal, heat pump and biomass systems. We provide turnkey renewable energy solutions that are individually tailored to the clients’ needs. Geoflow performs hourly energy modelling and quantifies the energy cost savings for a range of applicable energy efficient systems, to assist clients to make the best decision for their energy-saving investment. Geoflows’ services range from 3D energy modelling for compliance, energy audits, renewables feasibility studies, to the installation of one or a combination of solar thermal, geothermal and other energy efficient systems. Solar PV panels or solar electricity panels are used to convert sunlight into electricity. Solar PV panels based on crystalline and polycrystalline silicon solar cells are the most common. Most panels available in the market have efficiencies of the order of 14-15% when they are brand new. The figure below shows a typical solar PV panel specifications sold in Australia that has dimensions of 1m x 1.67m. Under the Normal Operating Conditions (NOC) with 800W/m2 solar irradiation, this panel can generate 188W electricity per its 1.67m2 surface area or 113W/m2. In other words, under the irradiation of 800W/m2, this solar PV panel can generate 113W/m2 which makes it 113W / 800W= 14.1% efficient. If this panel is installed in Melbourne at the slope of 37 Degree looking true north, based on historical climate data for Melbourne, the annual solar irradiation would be 1700kWh/m2/year. Using the above-calculated efficiency of 14.1%, it can be calculated that the panel can generate 1700x 14.1% = 240kWh/m2/year in best case scenario. The above data is valid in the lab under control conditions. There are several different factors that further drop the efficiency of a solar PV panel. GeoFlow has modelled a solar PV system with nominal 100kW capacity in Melbourne using hourly System Advisor Model (SAM). The results are presented in the following Figure. There are about 18 different parameters that can further reduce the electric output of the solar PV collector system. In this system, Geoflow has considered only 10 of them. The annual electricity generated by this 100kW system is 129706kWh/year. The system consists of 396 solar PV collectors each 1.6m2. Annual generated electricity by solar PV is 129706/ (396*1.6) = 205kWh/m2/year. Solar PV panels also lose about 0.6% to 1% of their performance per year which is not considered here. 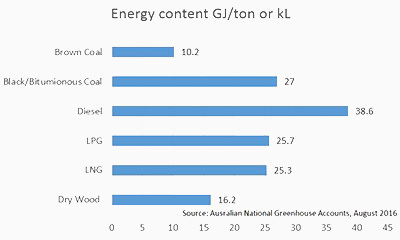 The Australian National Greenhouse Accounts (August 2016) is published by the Australian Government and provides the energy content and emission intensity of different fuels. Savosolar has used this data to compare different sources of fuel used commonly for heating in industrial process and greenhouses. Energy and emission intensities vary significantly for different types of energy and fuel sources. For instance, for the same heat output, the GHG emissions from natural gas may be only 55% of coal. The GHG emissions from electricity generation can also vary from location to location, depending on the fuel sources being used to generate electricity. By switching energy source, it is possible to significantly reduce both the energy cost and environmental pollution. In this section of website, the demand pattern from different energy users from residential to different types of commercial are discussed. Approximately 40% of world’s energy sources are used in our buildings both residential and commercial. The major part, about 80% of total energy use in our homes goes for space heating and cooling and domestic hot water generation. Your home energy demand can be substantially reduced by adapting passive design principles including thermal mass, external retractable shading that allows solar ray inside in winter and not summer, correct building orientation, cross ventilation and better insulation. Using renewable energy further reduces a building’s environmental impact. Thermal energy (heating, cooling and domestic hot water) can be sourced from more efficient renewable energy resources like geothermal and solar thermal to minimize carbon footprint of the building. Heat losses from swimming pools occur mainly from the water surface and various types of cover are available to reduce these losses in both indoor and outdoor pools. Solar pool covers should be regarded as a useful energy conservation measure with any type of pool and most will enable pools to function more efficiently as natural collectors of solar radiation, provided evaporation from the surface is minimized. Double-skin plastics film with encapsulated air bubbles. 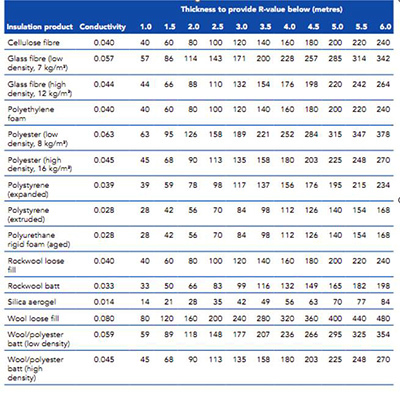 Closed-cell plastics foam, laminated to a reinforcing sheet of film or fabric. Covers are moved on and off the pool many times each season. Any pool cover should be sufficiently tough to allow necessary handling. Materials used for covers for open air pools should be adequately resistant to both ultraviolet radiation and to chemicals normally present in swimming pools. The main function of a cover is to reduce or eliminate evaporation from the surface of the pool. Floating covers of the types mentioned above are effective in this respect since they form a vapour barrier across the top surface of the pool. Any water lying on the top of the cover will reduce its effectiveness. The thermal benefits of using a floating cover may be significantly reduced during periods of high rainfall. With covers that are suspended above the water it is important to ensure that the edges are reasonably airtight since otherwise water vapour will escape. Another function of the cover is to reduce heat loss by convection. Sunlight that passes through the cover is largely absorbed by the pool water itself. The water can thus be heated naturally in the same way as with an uncovered pool but with the great advantage that the heat losses from the top surface are substantially reduced. It has generally been found that the use of a translucent pool cover is a cost effective option for an outdoor pool either in its own right or in conjunction with a solar pool heating system. There are some other benefits of covers also worthy of note, namely reduced chemical consumption on all pools, reduced fouling by leaves, etc on outdoor pools and reduced condensation and odour problems on indoor pools. Safety is an important consideration as pool covers generally cannot support the weight of a child or pet animal. Due to the risk of drowning, no one should swim beneath a cover. 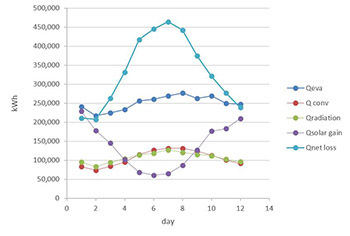 This is particularly important with floating covers.Calculation monthly heat loss from different mechanisms are presented in Figure 26 together with solar heat gain. As it can be seen in this picture heat solar heat gain is a major source of energy for the pool. Daily new heat losses are presented Figure shows the frequency of heat loss values which is used for peak load selection and sizing heat source to math 99% of the loads requirement. Globally, agriculture is a major source of energy consumption and therefore greenhouse gas (GHG) emissions. 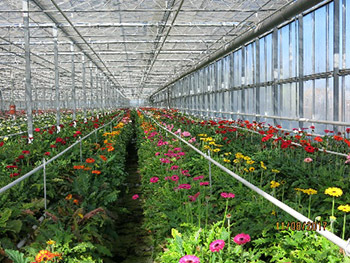 Nurseries/green houses are one of the most energy intensive forms of agriculture. Australia is currently the highest per-capita greenhouse gas (GHG) emitting country (24.3t CO2e/person) in the world. The Australian agricultural sector accounts for 15% of our national GHG emissions and is the second largest source of emissions (DCCEE, 2012). Based on a study by (Smith et al. 2008), this proportion is significantly higher than Central and Eastern Europe (3%), the former Soviet Union (3%), and the USA (5.5%). In order to reduce GHG emissions, the Australian Government in 2010 implemented the carbon trading scheme, entitled a “Carbon Pollution Reduction Scheme” (Department of Climate Change, 2008). This was abolished by the Government in 2014, which instead proposed a Direct Action Plan and allocated $2.55 billion for this purpose (Australian Government, 2014). With this plan, the government expects agriculture to contribute to Australia’s unconditional national target of a 5% reduction in GHG emissions by 2020 (Department of Environment, 2014). 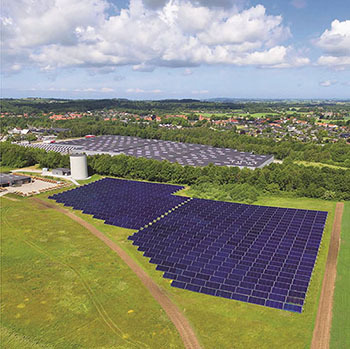 Savosolar collects large data base of energy performance from different nurseries around the globe with crop and climate close to Australia. Although these data cannot be used directly to compare with your greenhouse energy use, it can provide indicative data as energy performance benchmark. 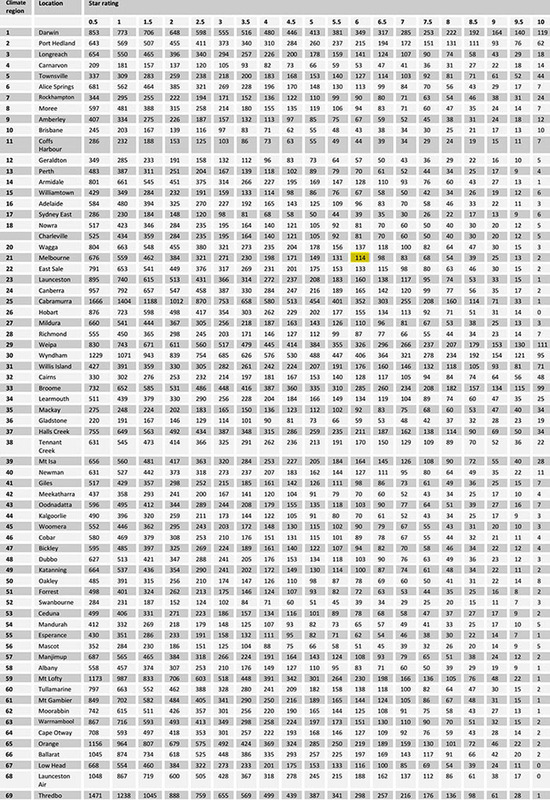 Here in this article some of this data is presented in tables below. Barber, 2004 surveyed 133 heated greenhouses in North Island New Zealand and 63 heated greenhouse in South Island New Zealand and reported energy intensity by region and crop type which Savosolar has summarised in the below table. It is concluded that roses are consistently the most energy intensive crop. Energy use is very strongly influenced by management practice, regional location, the type and age of greenhouse and type of crop being grown. Generally, smaller operations were less energy intensive, possibly due to capital constraints. New Zealand North Island is almost at the same latitude of site location (north Island 39.2378° S vs Melbourne 37.8° S) and has a mean annual average temperature of 15C which is close to 14C in Melbourne. Energy performance data from flower growers in North Island can be used to compare the energy performance of the green houses in Victoria and Tasmania with high energy intensity. Vox, G., Teitel, M., Pardossi, A., Minuto, A., Tinivella, F., Schettini, E. 2010. ‘Sustainable grennhouse systems’. In Sustainable Agriculture, Nova Science Publishers, Inc. ISBN 978-1-60876-269-9. CAE, 1996, Energy efficiency – a guide to current and emerging technologies, Vol. 2, industry and primary production. Centre for Advanced Engineering, University of Canterbury, Christchurch, New Zealand. Albright, L.D., and de Villiers, D.S. 2008. ‘Energy investments and CO2 emissions for fresh produce imported into New York State compared to the same crops grown locally ’, Cornell University,USA. Hatirli, S.A., Ozkan, B., Fert, C. 2006,’Energy inputs and crop yield relationship in greenhouse tomato production’, Renewable Energy, Volume 31, Issue 4, pp.427-438. Barber, A. 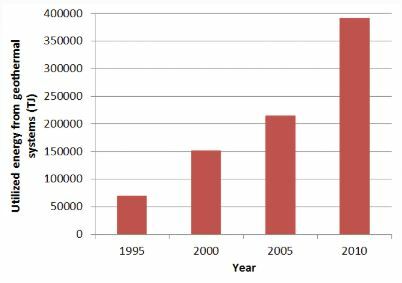 2004a, ‘Energy use and carbon dioxide emissions in the New Zealand vegetable & flower greenhouse industries’, AgriLINK NZ Ltd, Auckland, New Zealand. With skyrocketing gas and electricity prices, many property owners that are planning to build a high-end house are willing to invest in house energy efficiency. Our approach is to assist architects to use our service to first minimize heating and cooling demand of the house and then size a cost-effective renewable system for the house. Every new house needs to comply with the National Construction Code (NCC) energy efficiency provisions to be able to get a building permit. Most architects satisfy these provisions with 6 Star rating which doesn’t provide any real-life data for the building. Our solution is what is called Verification using a Reference Building Method in NCC (Section 2.6.2.2) and it replaces the 6-Star rating with a 3D realistic modelling (TRNSYS) that provides hour by hour heating and cooling loads. Geoflow then liaises with the architect to develop optimised cost-effective solutions, to further reduce building heating and cooling demand. Below is an example of an off-grid house in Moorabool. Working in conjunction with the architect, Geoflow managed to significantly reduce the house energy demand to less than half of its initial value under 6 Star Provisions. While satisfying the NCC energy efficiency requirements, our modelling software (TRNSYS) enables us to further investigate active solar solutions like solar thermal for space heating and hot water storage tank or solar electricity and battery storage or geothermal solution, etc. Geoflow models the dynamic interaction between the building and the proposed energy system(s) for a typical year, so that the long-term cost saving of the solution is determined. Our engineers properly model the building energy system(s) to enable architects to confidently assess different design options – not based on rules of thumb or guesses, but on actual kWh’s and $ savings. This ensures that home owners achieve the pre-quantified benefits from their energy efficiency investment. Contact us to discuss how we can assist you with your large residential building design. We define a passive house as a house that requires cost-effectively, minimum amount of mechanical heating or cooling. Homes that are passively designed take advantage of natural climate to maintain thermal comfort. With passive solar design we try to limit the heat gains in summer and heat losses in winter through climate-sensitive design of building envelope. A house built using passive solar design principles will generally be much less reliant on artificial heating and cooling and will, therefore use less energy and cost less to run. The passive house design is essential for houses that are planned to be off the grid. Lowering building demand allowing to lower the capital investment on solar electricity and battery and solar thermal heating/cooling and hot water storage tanks. Note for the order of different principles above as it is the key for to a cost-effective passive house design. Homeowners don’t need to invest several tens of thousands in excessive and unnecessary insulation where a proper modelling and design can reveal cheaper options to better take advantage of natural climate at lower installation costs. At GeoFlow Australia, we use TRNSYS software to model all building’s thermal details in 3D. TRNSYS is the most advanced thermal modelling software that is used in industry and research for implementation of new innovative energy systems. Modelling in 3D allows considering almost all the details for the building thermal modelling. It also minimizes errors in modelling as you can see the building in 3D and compare it with architect’s plans. Neighbouring buildings and objects can be exactly modelled and shading effects can be assessed for any time of the year. Internal heat gains by occupants and schedule of operation can be modelled as requested by homeowners every detail. The most important final output of modelling is hourly building heating and cooling demand and electricity/gas/hot water consumption. At Geoflow we want to achieve the lowest building energy demand with cheapest energy efficiency options. For instance, we won’t consider triple glazing with an aluminium frame and thermal break where a double glazed UPVC window can deliver similar saving at half the cost. We model different energy efficiency options and assess annual hourly building loads and savings for each option and let the architects/builders/homeowners decide based on annual cost saving which options they want to take. Because the climate varies so much across Australia, the passive design is not a single set of strategies all of which are applied equally in every house and climate. For instance, higher shading is desirable in a warmer climate where it can lead up to increased annual demand in mild and cool temperate. Same applies to different types of glazing. Warm climates should minimize heat gain from glazing where in the in the cool temperate, different type of glazing are used to increase solar heat gain during the day. At Geoflow, we use appropriate strategies in our modelling to take into account the climate and specifics of the site to minimize the heating and cooling requirements of the building, cost of running the building and consequently the carbon footprints of the building. In the following summary of key points for the different passive house design principles are discussed. The co-benefits of GeoFlow’s passive solar modelling is to use data from passive house modelling to design your renewable energy system. Sometimes, for some people, this co-benefit becomes the major focus. One of the key outputs of GeoFlow’s energy modelling is hourly energy outputs. These hourly outputs can be used to find peak demand, annual total heating/cooling demand, annual total electricity to run appliances and annual total hot water demand. The software can also show any heat loss/gain from any part of building envelope like a window, walls, etc., for any time of the year which comes handy when comparing options like different glazing from different manufacturers. These hourly outputs are the key for proper design of renewable energy system as a source of energy. With conventional energy sources like grid electricity, split heating, gas heating, etc, annual demand is not a design factor as they are unlimitedly available as long as you pay for the bills. However, with renewable energy generation for yourself, it is important to know hourly and annual demand for energy to be generated to cost-effectively spend the available capital. Renewable energy generation system for your house includes but not limited to solar electricity, battery storage, geothermal and solar thermal heating/cooling. The oversizing and wrong design could cost a lot of capital investment which could have been used more cost-effectively. TRNSYS software allows modelling almost any energy source system like geothermal, solar electricity and solar hot water to be designed for best satisfaction of the building demand for every hour of the year. In other word, our passive solar design enables us to use data from passive house modelling to use for your solar hot water and electricity generation and storage design. There are 6 different types of insulations. The first 3 are mostly radiant insulation and last 3 are mainly bulk insulation. 1. Single Sided Foils: A polymesh woven material with a reflective foil adhered to one side and are sometimes referred to as a radiant barrier insulation. Polymesh products are also available in breather (moisture vapour permeable grades. (Emissivity of bright face is approximately 0.03, poly weave face is 0.87). Vapour permeable breathers are very useful in cold climates like Melbourne to allow moisture from inside the building to escape outside and condensate on external cladding of the building. Vapour permeable breather allows water vapour to escape outside the building frame and holds out air and water to enter inside the building frame. Removing moisture from indoors and building frame allows to avoid mildew and Mould growth in the build frame, swelling of wood, staining of internal linings due to moisture from the building, Wood decay and loosened metal fasteners. 2. Double Sided Antiglare Foils: Antiglare foils with reflective foil on each side of an inner paper based lining, one face being coated with an antiglare ink to reduce glare. Emissivity of bright face assumed to be 0.03, antiglare face is 0.1. 3. Bubble/Foam Foils: Double sided reflective foils. One side coated with antiglare to reduce glare. Centre is typically 7mm thick single layer of individual air bubbles with Emissivity of bright face assumed to be 0.03 and antiglare face is 0.10. Roofing blanket consists of a bulk flexible insulation like a blanket faced on one side with reflective foil laminate. Depending on the thickness of blanket, R-Value can vary. 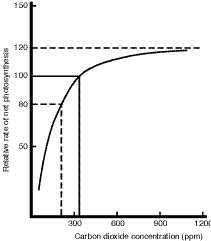 The emissivity of bright face is assumed to be 0.03 when clean. Expanded polystyrene rigid sheets (EPS) faced on both sides with a reflective foil laminate, one face additionally coated with an antiglare ink to reduce glare. Emissivity of bright face assumed to be 0.03, antiglare face is 0.10. Bulk insulation is more effective above the ceiling than under roof. Reflective foil insulation is more effective under a roof. Walls can be effectively insulated with bulk and /reflective foil insulation. However, the effectiveness of foil insulation will be reduced if there is not enough still air gap (minimum 25mm) in front of the foil. In heating dominant areas, unwanted shading from eaves is probably the most important factor affecting the thermal design of the house. As shown in the picture, the area immediately below a horizontal building element like an eave is virtually permanently in shade. In climates that can benefit from solar gains for heating in winter, it is important to ensure that any fixed horizontal shading device doesn’t keep the top of glazing in permanent shade. A shaded area of glass makes no contribution to winter solar gain and can lead to a large amount of heat losses to ambient.Even use of thermal mass elements in the permanently shaded area is useless as they are never exposed to warmth. It is important that eaves dot restrict the solar access of mass elements. 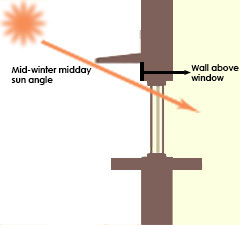 Thus in climate zones where heating predominates, top of the window must be far enough below the eave to prevent overshadowing at mid-winter. Providing a clearance between horizontal overhangs and top of the window is an important low-cost strategy thermal performance of the house. Here a description of modelling tools used by Geoflow is presented so our clients can rest assured that we don’t use rules of thumb at cost of our clients. We use TRNSYS 3D building modelling which allows drawing a multizone building by considering thermal mass, self-shading, external shading and internal view factors for radiation exchange. 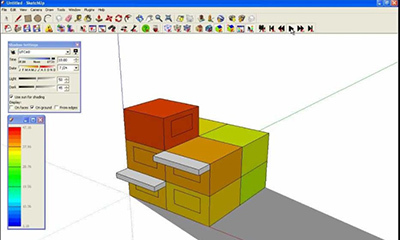 The data we need for modelling is the building plans, elevations and specifications if they are available. TRNSYS is the most comprehensive suite of tools that allows modelling the building, geothermal heating and cooling, solar electricity, solar thermal and any other thermal phenomena in a single model and assess the interaction of different systems on each other. According to the NatHERS star rating protocol, star bands are introduced for NatHERS building modelling approach to assigning star rating for residential buildings.The figure below represents the star bands for 67 different cities in Australia. For instance, Melbourne is called climate region 21 and to achieve 6-star rating, the building must not consume more than 114 MJ/m2 or 31.6kWh/m2. In other words, theoretically, a 200m2 6-star building in Melbourne annual heating and cooling energy demand shall be about 200*31.6kWh/m2= 6320 kWh. The below star bands are valid for a house of 200m2. For smaller or bigger houses, the star rating is adjusted to consider the surface area of the house. For bigger houses, this adjustment is like a fixed penalty for house star rating regardless of the quality of building thermal fabric. Basic energy assessment grant: Up to $2000 towards the cost of a basic energy assessment and a further $3000 bonus to implement energy efficiency actions. This is recommended for businesses spending between $20,000 to $50,000 on energy per annum. Detailed energy assessment grant: Half the cost of an assessment up to $15,000 and a further $5000 bonus to implement energy efficiency actions. This is recommended for businesses spending more than $50,000 on energy per annum. Geoflow Australia has been involved in this program for a long time and we are one the approved assessors with Sustainability Victoria. Geoflow’s energy assessments are based on or equivalent to a Type 2 Energy Assessment (Australian Standard AS/NZS AS3598.1:2014, AS/NZS S3598.2:2014). You can read more about this grant here. An energy assessment will identify potential energy efficiency improvements for your business. There are few reasons that justify why having an energy assessment performed for most businesses is the right decision. The first simple measure to increase energy efficiency is minimizing the waste energy. Insulation can be applied to the energy distribution pipes and some areas of the hothouses. For instance, heat loss from a hot water pipe can be reduced by 60% with using 10mm thick insulation and by 77% by using 25mm Rockwool insulation. Depending on the lengths of pipes that are exposed to ambient temperature, recommendations for this measure can be finalized. Boilers efficiency improves when the leaving water from the boiler is at lower temperatures. To reduce the boiler set point and yet satisfy the variable demand, we suggest changing the automation logic from a single set point to a variable set point for the boiler. The boiler set point can be automated to be reduced when outdoor temperature rises to allow maximizing the efficiency of the boiler. This automation can be simply implemented by the addition of a single temperature sensor which measures the ambient temperature and adjusts the boiler set point based on the ambient temperature. The figure bellow shows that matching the boiler output temperature with demand can improve efficiency by 15% which is about $135K saving for the business owner. The co-benefits of this measure is also increased boiler lifespan as corrosion rate reduces by the reduced operating temperature of the boiler. 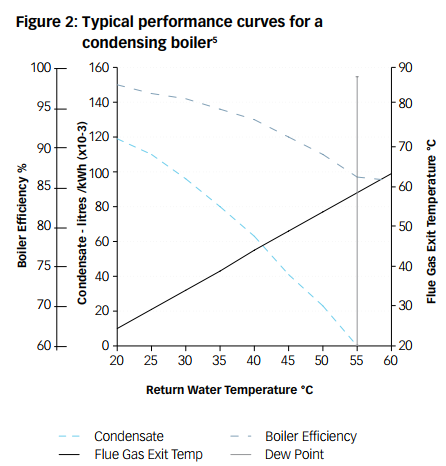 Another method to increase boiler efficiency is by increasing the surface area of the heat pipes to allow delivering the same heat in kW with hot water at lower temperature. Similar to the measure discussed above, this will allow to permanently reduce the set point levels and improve the boiler running efficiency. The co-benefit of this measure is increased the productivity by increasing crop growth. Based on a study at the University of Wisconsin, It is suggested to utilize plastic HDPE pipes instead of steel pipes as heat pipe as they are far cheaper and easier to install. Based on a recent purchase for a client, the price of 25mm HDPE pipe is $0.7/m which offer an easy and affordable option for this measure. Most of the heating demand for a greenhouse is during electricity off-peak hours which makes electric heat pump heating a viable option. During the night (11Am to 6AM), power generators run at their lowest capacity as demand drops and retailers offer electricity at almost half the cost of electricity during the day. This is a great cost-saving opportunity for businesses with high heating demand during the night to use. a Geothermal heat pump or air source heat pump can be used to deliver hot water for hydronic heating. Geothermal heat pumps can extract energy from the ground, groundwater and irrigation dams which have a higher and more stable temperature than air and hence can operate far more efficient than other types of heat pumps. Refer to our Geothermal page to read more about geothermal technology. Air source heat pumps are not as efficient than geothermal heat pumps but they can still offer benefit in compared to expensive liquid or natural gas. The efficiency of heat pumps varies from 250% in case of air source heat pump to 550% geothermal heat pumps. This means for delivering, for instance, 100kW heating energy, 40kW to 18kW (in the case of geothermal) is needed and when half price offpeak electricity is factored in the analysis, it may make sense to switch to heat pump heating during the night. Gas heat pumps are cheaper to run in Australia. They might be more expensive to install and maintain but it is worthwhile to consider the economy of this option for the Piovillico business. 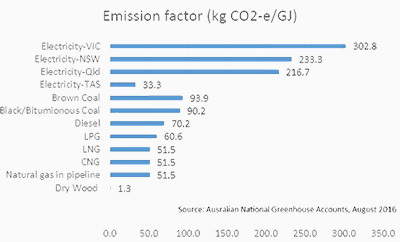 The co-benefit of this measure is reduced GHG emissions as gas is by far more cleaner (about 5 times) in compared to electricity generated in Victoria with brown wet coal.